Catania - Ian McKinley kicked a penalty on his international debut as Italy got their November Test series off to a winning start with a 19-10 victory over Fiji in Sicily. Italy's coach Conor O'Shea named fellow Irishman McKinley among five uncapped players to face Fiji, Argentina and South Africa in this month's November internationals. The former Ireland Under-20 player - wearing specially manufactured goggles after he was blinded in his left eye by a teammate's stud eight years ago - came on as a substitute on 62 minutes to close the match with a penalty kick. 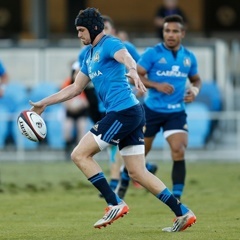 Carlo Canna scored 11 points as Italy ended a series of nine consecutive defeats going back to their stunning victory over South Africa in November 2016 in Florence. "It's difficult to win matches of this level and it's hard to take advantage of the chances when you're not used to winning," said O'Shea. The hosts dominated early with Benetton prop Simone Ferrari touching down after 28 minutes with Zebre flyhalf Canna converting. Leone Nakarawa pulled Fiji level 10-10 at the break with a 39-minute try after a tackling error by Italy captain Sergio Parisse. After a first half hour of high-intensity, Fiji regained possession in the final ten minutes of the first half with Leone Nakarawa's try converted by Ben Volavola with a Volavola penalty completing the visitors scoreline. Then 27-year-old former Leinster flyhalf McKinley, now playing club rugby for Treviso, stepped up to seal victory for his adopted country. "We got ourselves into trouble in the first half by giving them the 10-10, my fault too for a bad tackle," said Parisse. "I'm proud of the guys. It's a good start even if it wasn't perfect. This victory gives us serenity to work towards the next two matches," the skipper added. Italy next play Argentina on November 18 in Florence and South Africa on November 25 in Padua.